New Zealand’s natural beauty lures millions of intrepid guests to our shores every year. We ask guests to adopt a role of Kaitiaki, a culture of stewardship and duty of care as you discover this Great Southern Land. Leave only footprints. It’s an old cliché but if we all work toward the same goal, we can keep NZ beautiful for all. 'Kaitiaki' is a guardian of land, air and water. The practice of caring for and looking after our environment is known as Kaitiakitanga. NZ is working hard to increase facilities and make it easier for guests to dispose of their waste appropriately. If you cannot find a rubbish bin, please take your rubbish with you. Southproud.co.nz lists all South Island Council websites so you can find local refuse/recycling stations. Your waste is your responsibility. Littering is an offence in New Zealand and those found to be disposing of waste inappropriately may be fined. This is not just a sticker on your camper or van. It’s about the practise of containing your waste until you arrive at an appropriate place to dispose of it. If you are not using camps with kitchen & bathroom facilities, self-containment means you use the kitchen and bathroom in your camper, containing all waste water and effluent until you find an appropriate dump station for discharge. Bathing and washing your dishes in our rivers and streams has an adverse effect on our environment. Soaps, shampoo’s and detergents in our waterways are harmful to our native fish. Remember, you’re only self-contained if you are practising self-containment. Many visitors to New Zealand choose the freedom of using an RV or Campervan to explore. Dump Stations are listed on Southproud.co.nz making it easy for you to find a discharge point. Please use them. Discharging human effluent in our bushes or on roadsides is an unacceptable and illegal practise. This includes defecating/urinating in public spaces. While New Zealanders are happy and welcoming people, we don’t take kindly to those who sully our environment. Public toilet facilities are listed on our website for your convenience. Some of New Zealand’s best scenery is just a short walk from the roadside. Tracks are well marked and accessible. Please stay on the tracks. Wandering into the bush can disturb native seedlings and ground nesting birds. Tracks are marked out by experts to ensure you have a safe and pleasant route to follow and to protect our native flora & fauna. Prior to venturing into our forest or using tracks, please make sure you have prepared appropriately for your trip. New Zealand Mountain Safety Council have excellent resources to help you prepare for any outdoor excursion. 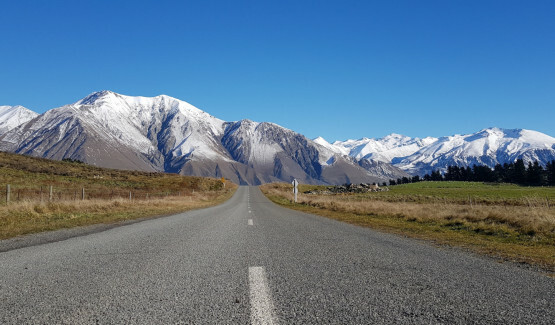 New Zealand's roads can be narrow and winding. Here's some great tips for staying safe on our roads. We love New Zealand, and we know you will too. Enjoy your stay and remember, leave only footprints. We are all 'Kaitiaki'.